Determine the velocity loss for various values of t, substract each from the corresponding ordinate of the free recoil velocity curve and draw a curve through the resulting points. If the effect of the spring constant proves to be negligible, this curve is the retarded velocity curve. 4. Assume that the curve drawn in step 3 represents the actual time-travel curve and use this curve to determine the retardation due to the spring constant. 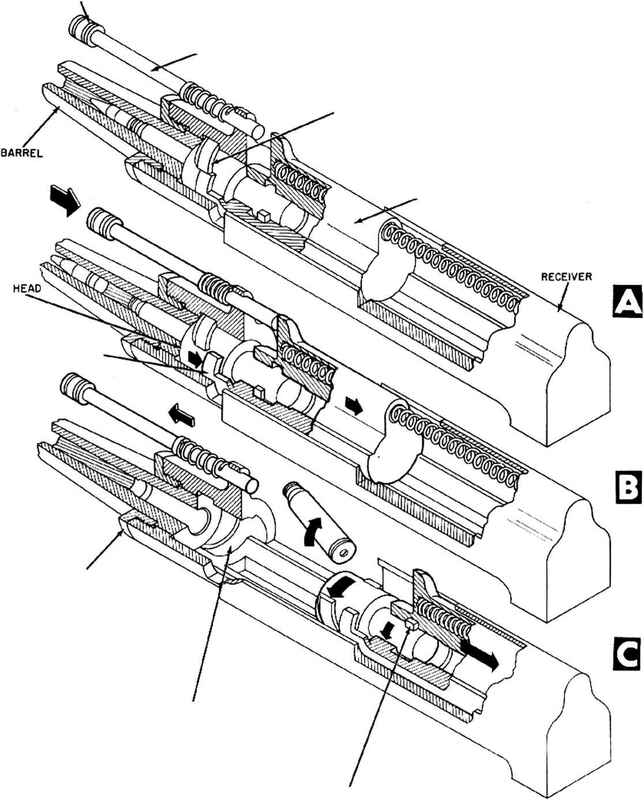 (Use the combined spring constant for the barrel spring and bolt spring, K1 + K2.) Ordinarily, it will be found that this retardation is so small that it will not have any effect worthy of consideration. 5. In the event that the retardation determined in step 4 is sufficient to affect the velocity, use it to modify the curve drawn in step 2 and then integrate under the new curve to obtain a corrected displacement curve. 6. Steps \ and 5 can be repeated as often as is necessary until no significant change occurs in the displacement curve. Actually, this process of successive approximation should never be necessary and satisfactory results should be achieved in the first three steps or at least in the first five steps. The loss due to the combined effect of the spring constants as determined by the method of step 4 is only about 0.345 foot per second. The final curves shown in fig. 2-10 are the result of performing step 5. Since the velocity loss due to the cffcct of the spring constant is so small, step 6 need not be taken.